You’re on a strict schedule today. With a record amount of service calls to attend to, everything must go exactly as planned. But on your way to the third service call, you start to notice weird noises coming from your company van. You pull to the side of the road to get a closer look—and it doesn’t look good. Well, you were ahead of schedule. 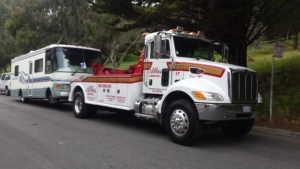 After a quick Internet search for a reputable towing company, you stumble upon Atlas and place a call—unaware that you didn’t just become a name on our to-assist list; you became our priority. Medium-duty tow trucks’ petite size creates an unmatchable ease of maneuverability, allowing for the retrieval of vehicles stuck in even the most confining situations. The strength of its tow and recovery power exceeds the industry standard, reinforcing the invaluable characteristics that medium-duty tow trucks provide to our fleet. Equipped with a modern, wheel-system design, medium-duty tow trucks specialize in eliminating all tow truck and vehicle contact, except for the rubber on the vehicle’s tires. This design allows for a vehicle to be lifted off of the ground by securing either the front-two or back-two wheels, which are then suspended in the air. The other two wheels remain in contact with the road, to provide towing assistance throughout the vehicle’s transportation process. Which Vehicles are Medium-Duty Worthy? Atlas is able to prevent your business from taking a hit over a rectifiable situation with our medium-duty trucks’ extreme flexibility and versatile characteristics. We believe in quality service—providing it to our customers and helping our customers’ businesses to provide it to theirs. Our team understands the need to get a company vehicle on the move and back to work. So, when you call Atlas, you can rest assured that your company vehicle instantly becomes our priority. 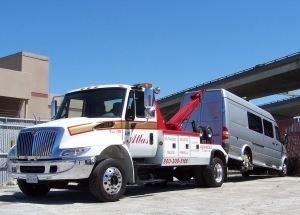 When you find yourself in an unfortunate situation, let the Atlas team get your vehicle back on the road. Contact us at 800.300.5166 today, and we’ll be on our way.